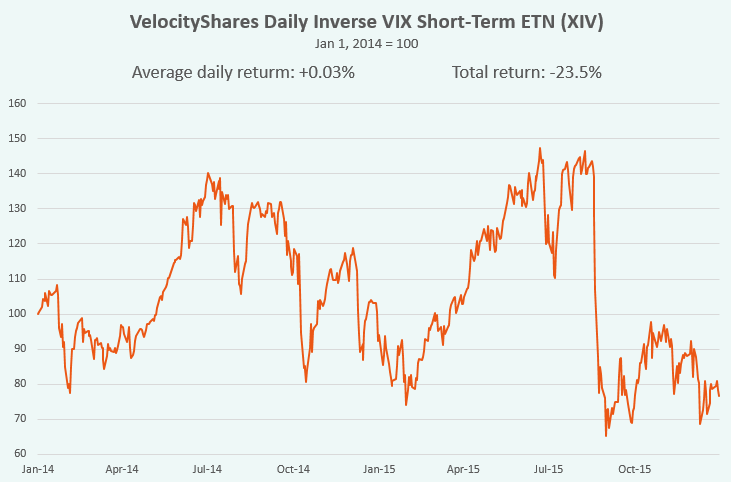 It is well known that, in case of returns compounding, the volatility of a strategy can harm the final total result. Having positive mathematical expectation (arithmetical average) but unstable returns, it is possible to ruin the whole portfolio. For instance, having lost 50%, it is necessary to gain 100% to break even. That mathematical phenomenon is often called the “volatility drag” that makes the geometric average returns always less than the arithmetic average if the variance of returns is greater than zero. If all returns are compounded, the geometrical mean is actually what builds the final portfolio value at the end. Many inverse and leveraged ETFs also suffer from the volatility due to the daily rebalancing and compounding – to maintain their leverage ratios constant. Having huge volatility, especially in leveraged ETFs, those products can be the great value destroyers despite the positive mathematical expectations. The OptionSmile platform has all necessary tools and indicators to identify and quantify that volatility drag and find the right instruments to fight it. 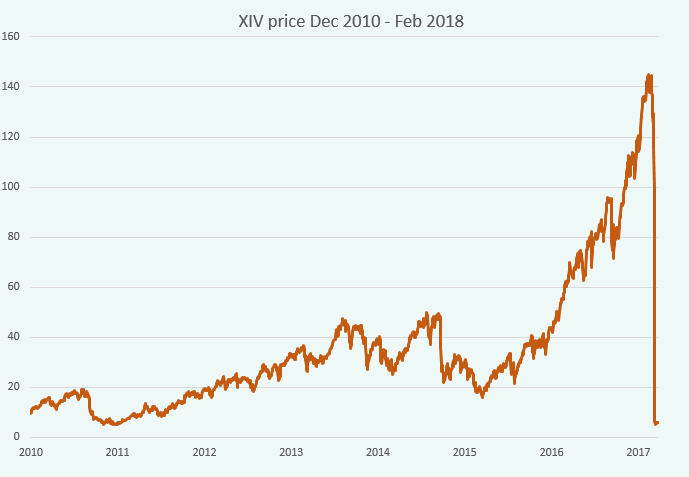 Finding the mathematical expectation of an option payoff – its Fair Value – and comparing it with the Market Price is just the starting point of a strategy development. Having positive expected returns is the minimum requirement for the profitable result. In fact, with the expected loss, it is impossible to reach a positive total portfolio gain with any volatility level, even zero. Having the Fair Value exceeding the Market Price or vice versa for short positions, we get a positive Expected Profit/Loss and, hence, the positive Return on Margin (for margin positions) or Return on Market Value (for non-marginal positions) – see the performance metrics workflow in the Tutorial. The next step is to make a decision about the portfolio share we are going to put on risk. In other words, we should set the Position Size parameter (two indicators – Kelly criterion and Optimal Position Size to assist in this choice), and get the Return on Portfolio metric, which is still calculated as an arithmetic average. 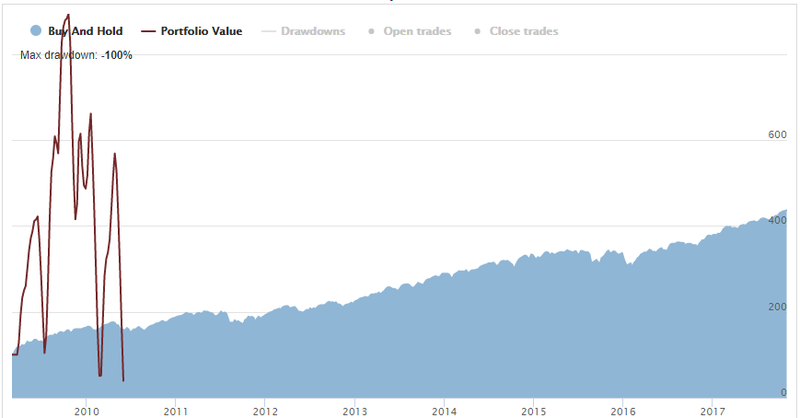 Finally, to get an indication of the total return with compounding, the Geometric Average Return on Portfolio is calculated. The difference between these two Returns on Portfolio (arithmetic and Geometric) can be considered as an indication of the abovementioned volatility drag. 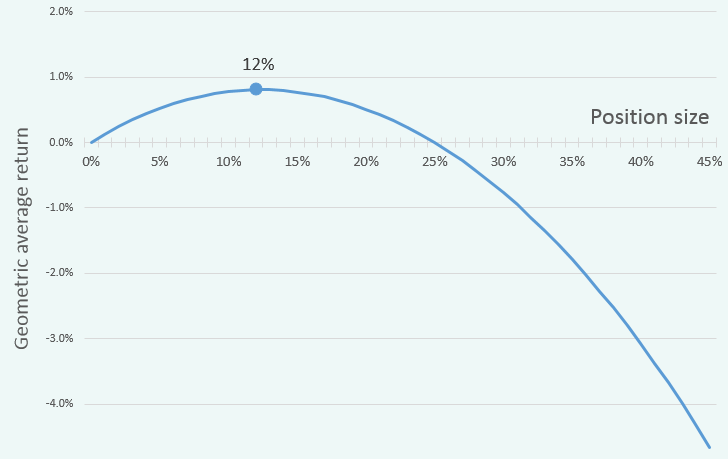 Its size is the direct outcome of the Position Size parameter: the greater the portfolio share we put on risk, the bigger is the discrepancy between the arithmetic and geometric returns. As we see, the strategy of calls buying has been profitable on average on that Bull Market. 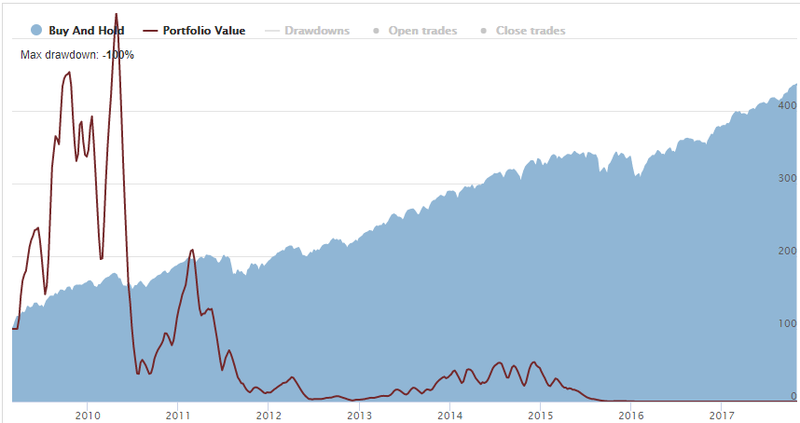 It is obviously the result of the “overbetting” (setting too big position size) and the volatility drag which has ruined the whole portfolio. It is still overbetting, obviously. What is the optimal position size then? Not too low to provide enough return and not too big to destroy the portfolio by overbetting. The OptioSmile strategy performance metrics has two indicators to assist in this task: Kelly criterion and Optimal Position Size. Both of them do the same job: they calculate a position size that maximizes the total return. The second one is more suitable for our purpose since it directly maximizes the Gometrical return. For details, see here. Not a quite impressive performance but at least not losing money. 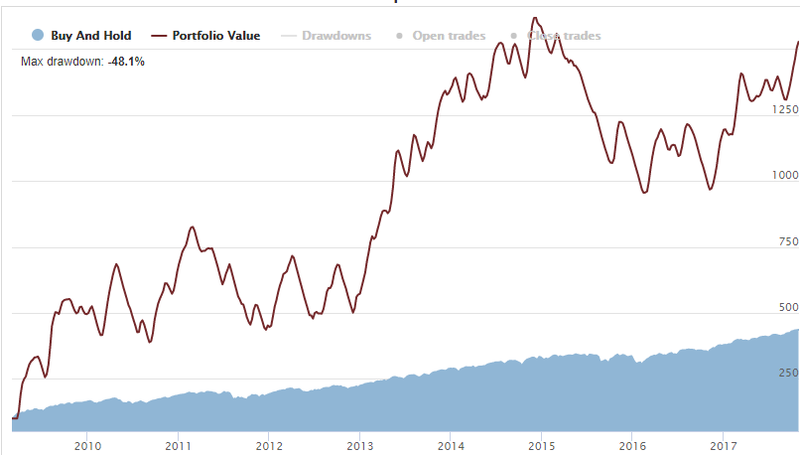 Note that Buy&Hold strategy has had higher terminal portfolio value at the end than our Long Call strategy even with the “best” portfolio sizing. It turns out that for this period (2009-2017), no position sizing parameter exists that would allow an ATM LongCall strategy (with compounding) earn more than a simple Byu&Hold strategy. Even though it has higher mathematically expected return (with 100% position sizing – much higher) than the Byu&Hold has. However, there is always a possibility to refrain from the compounding of returns and stay in the arithmetic average paradigm. 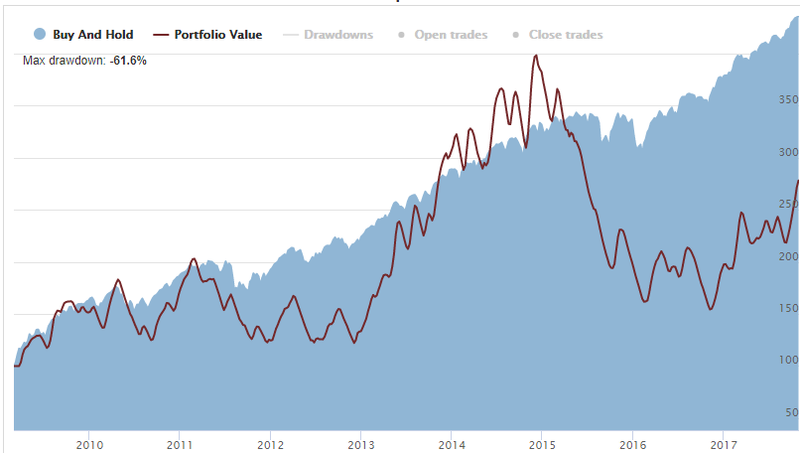 In this case, we set the initial total portfolio value, the position size parameter, and (by multiplying these two) the sum of money we are going to put on risk. That amount should be kept constant disregarding the previous returns and the resulting portfolio value. This has changed the whole picture. The equity line is still not so pretty and has vivid plateaus and big drawdowns, but it completely differs from the variant with compounding. It is necessary to note that in this approach, the share of portfolio at risk – in percentage term – will be floating depending on the previous results. In case of profit accumulation that ratio will decrease, and, if we get losses, it will increase. For example, in some extreme situation, having position size of 50% and suffering a loss of 50% of the portfolio, we have to put at risk the whole remaining half (100% Position size) to keep the absolute amount of money at risk constant. Nevertheless, in some strategies, such as discussed above, the profit/loss accumulation without compounding can produce superior results relative to a strategy that capitalizes all the returns. In any case, the OptionSmile platform has the whole arsenal of various tools to identify the proper parameters for an options trading or hedging strategy.